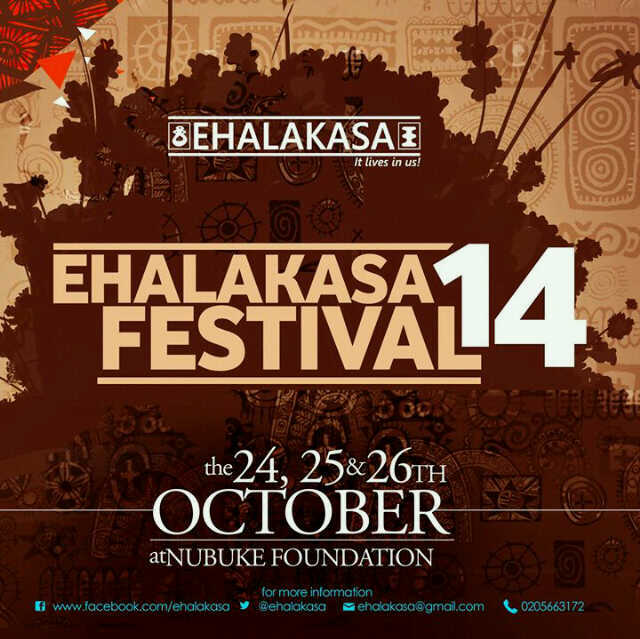 Ehalakasa Festival returns to Nubuke Foundation from 24th to 26th October. For three nights Ehalakasa’s essence of presenting spoken word, music and dance on one stage will offer an entrée into the growth of poetry and other performance art disciplines in Ghana. Performing at the 7th Annual Ehalakasa Festival 2014 are Wanlov The Kubolor (FOKN BOIS), Mutombo Da Poet, Chief Moomen, Dzyadzorm, Asantewaa (Poetra), Rhymesonny, Paul Forjoe (100%), Kwame Write, Namoji Obese, Kyekyeku, The Rainers band and many more. Following an intensive slam series in 2014 and incredible live events throughout the years the Festival will highlight 44 outstanding Ehalakasa performers over the three-day period at the Nubuke Foundation in East Legon (behind Mensvic Grand Hotel) in Accra. Ehalakasa, since 2007, has been the quintessential experimental and interdisciplinary platform fostering new ideas and collaborations in spoken word, dance and music. This year we celebrate contemporary Ghanaian spoken word culture, music and dance while interrogating its historic background. The Festival is also dedicated to Nii Lante Lamptey (Ehalakasa co-founder) and legendary African-American spoken word performer, Dahveed Nelson (founder of The Last Poets, USA), with well wishes as they recover from illness. Over 200 poets, musicians and dancers have performed for more than 5000 live audiences and tens of thousands more online and on-demand. Poetry, music, arts enthusiasts and fans from across the country are all invited to this year’s event. Tickets for the Festival go for Ghc15 per day and a round ticket of Ghc 40 for all the 3 days. Festival T-shirts will be on sale as well as Ehalakasa T-shirts. Advance tickets on sale at Nubuke Foundation, East Legon and Foundation for Contemporary Art, W.E.B Du Bois Center, Cantonments. For Advance tickets and additional information, please call 0205663172. Visit Ehalakasa’s social media platforms and website for updates. Join the conversation @ehalakasa and hashtag #Ehalakasafestival2014 on Twitter. Ehalakasa, it lives in us! !